PORT MORESBY, Papua New Guinea — On Tuesday, Papua New Guinea’s Supreme Court ruled that Australia’s practice of detaining asylum seekers on Papua New Guinea’s (“PNG’s”) Northern Manus Island was illegal and must stop. Refugees and asylum seekers detained on Manus Island under Australia’s off-shore processing system will be allowed to seek hundreds-of-thousands of dollars in compensation. There are currently 850 men in the detention center on Manus Island; roughly half have been found to be refugees. The five-man bench of the court ruled the detention breached the right to personal liberty in the PNG constitution. PNG’s Supreme Court has ordered the PNG and Australian Governments to immediately take steps to end the detention of asylum seekers in PNG. Of those currently located on Manus Island, the vast majority of men in the detention center have been found to be refugees. The court ruling said they were seeking asylum in Australia but were forcefully brought into PNG and locked in an Australian-funded center enclosed with razor wire. Furthermore, Justice Terence Higgins said the detention also breached asylum seekers’ fundamental human rights guaranteed by various conventions on human rights at international law and under the PNG constitution. The camps have been widely condemned and many have called for their closure. Some detainees have been in the camps for more than three years. Immigration Minister Peter Dutton has said the roughly 850 men being held at the Manus Island detention center will not be brought to Australia. In a statement on Tuesday afternoon, Mr. Dutton said the legal proceedings did not alter Australia’s border protection policies, which he has said will remain unchanged. Under Australia’s controversial immigration laws, anyone intercepted while trying to reach the country by boat is sent for processing to camps in Nauru and Manus Island. They are never eligible to be resettled in Australia. Mr. Dutton further stated that refugees at Manus Island could resettle in PNG, and those whose claims for asylum were rejected should return to their country of origin. BRISBANE, Australia — Over the weekend, the Australian government confirmed that all the asylum-seeking children that were being held in mainland immigration centers across the country had been released. However, this appears only to be possible as the government has reclassified sections of detention centers as “community detention” in order to be able to claim that all children have been released from immigration detention. Following a High Court decision earlier this year, approximately 90 children currently in Australia are due to be sent to Nauru. 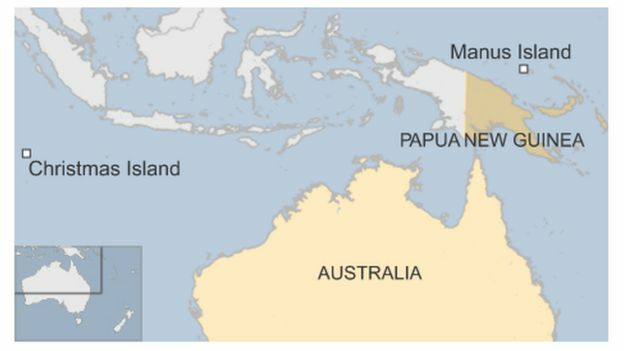 Under its strict anti-immigration policy, Australia currently detains all asylum seekers arriving by boat, holding them in detention camps in Nauru and New Guinea. Over the past year, as the number of refugees fleeing conflict-hit zones in the Middle East has surged, the Australian government has increasingly faced severe criticism from several human rights groups over the conditions in these detention camps. 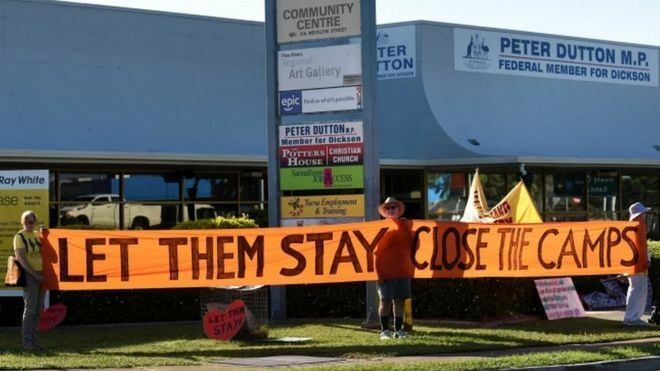 Australian Immigration Minister Peter Dutton over the weekend in Brisbane told reporters, “Today we have no children of boats in detention, and that is a significant achievement of this government.” “It’s been almost a decade since there were no children in detention,” Dutton added. Specifically, officials in Australia say the last group of children ranged from a baby to a 17-year-old. According to SBS, Mr. Dutton said the last few children’s cases had been complicated because they involved one parent being subject to a negative security assessment from the national spy agency, but the whole family had been in detention so they wouldn’t be separated. As for the status of the children, Mr Dutton told the ABC the Government’s policy had not changed in relation to the children, who are currently in Australia either for medical treatment or accompanying a family member to hospital. “They are all subject to go back to Nauru once medical support has been provided and we’ve been very clear about that,” he said. In a report published last February, Australia’s Human Rights Commission said that hundreds of refugee children were suffering from severe mental illness as a result of prolonged detention at these offshore processing camps. JAKARTA, INDONESIA — Indonesia on Monday strongly protested the Chinese government and demanded it clarify the actions of a Chinese coast guard vessel that reportedly had contravened law enforcement measures being conducted by Indonesian authorities against a China-flagged boat allegedly committing illegal fishing in Indonesian waters. According to Foreign Minister Retno Marsudi, the Indonesian government submitted a protest to China’s charge of affairs Sun Weide in Jakarta over the incident in Indonesia’s economic zone near the Natuna islands. Foreign Minister Retno said the coast guard ship had disrupted Indonesian authorities who were acting in accordance to the United Nations Convention on the Law of the Sea (UNCLOS). Beginning Saturday evening, the Chinese fishing vessel was stopped for fishing illegally in Indonesia’s waters and was being towed to port when the Chinese took it back, leaving its crew in the hands of Indonesia. Arrmanatha Nasir, a spokesman for Indonesia’s Foreign Ministry, stated that Indonesian personnel boarded the Chinese boat, the Kway Fey, took its captain and eight-member crew into custody, and began towing the ship back to a base on the Natuna Islands. But around midnight, he said, a Chinese Coast Guard vessel, which had been following the Indonesian ship, approached it on or inside the 12-nautical-mile line marking Indonesia’s territorial waters, eventually hitting the ship. According to multiple Indonesian sources, China’s Coast Guard rammed one of the country’s fishing boats to pry it free from the Indonesian authorities. Indonesia decided to release the boat and proceed to shore with the crew. On Monday, a spokeswoman for the Chinese Foreign Ministry, Hua Chunying, called the area where the episode took place traditional Chinese fishing grounds, and said that the Coast Guard vessel had not entered Indonesian territorial waters. Indonesia’s Marine and Fishery Minister Susi Pudjiastuti however disputed the statements from China, particularly those pertaining to traditional fishing grounds. “There’s no international treaty which recognizes or admits what’s been claimed by the China government as traditional fishing ground. If there’s such, that’s a one-sided claim and not acknowledged by the international community,” she told reporters. CANBERRA, Australia — Australia’s record of sending asylum seekers to Nauru and Manus Island in Papua New Guinea, as well as policies of mandatory detention, boat push-backs and soaring indigenous imprisonment rates have resulted in heavy criticism from Amnesty’s annual human rights report. For example, Amnesty International has found in its report Australia’s boat policy has acted as an example for other countries in the region to force asylum seeker boats back to sea. The Australian High Court has recently declared the nation’s decision of sending 267 asylum seekers to Nauru detention centers as legal. Australia stuck to the decision in spite of knowing about the harsh living conditions, violence, and abuses reported at the Nauru detention camps. Prime Minister Malcolm Turnbull defended his position by saying that the authorities want the nation to have secure borders. “Our commitment today is simply this: the people smugglers will not prevail over our sovereignty. Our borders are secure. The line has to be drawn somewhere and it is drawn at our border,” said Turnbull earlier in February. While global attention was focused on refugees migrating from the Middle East and Africa into Europe, forced migration across south-east Asia remained one of the most prominent rights abuses in the region. In May 2015 as many as 8,000 people were left stranded on boats at sea because south-east Asian countries such as Thailand, Malaysia, and Indonesia refused to let them land and, in some cases, towed their vessels back to sea. Amnesty’s Australia national director, Claire Mallinson, said Australia’s policy of turning back boats to their countries of transit or origin was providing an example, and a justification, for other countries to do the same. “Last year we saw Thailand, Indonesia, Malaysia refusing to allow boats to land, or towing boats back to sea,” Mallinson said. “Australia has a proud record of defending human rights,” she said. “It helped form the UN, it helped draft the universal declaration on human rights, but before it can be that constructive player again, it needs to get its own house in order. The report also condemned Australia’s treatment of its Indigenous peoples, and called on the government to set justice targets to reduce the over-representation of indigenous people in prisons. CANBERRA, Australia — The Australian High Court on Wednesday dismissed a claim that detention of asylum seekers offshore on Nauru violated the Australian constitution, and upheld its policy to hold refugees at processing centers on the island. In a decision announced in Canberra, the court found the Commonwealth’s conduct was authorized by law and by Section 61 of the Constitution. The ruling paves the way for more than 250 people, including 37 babies, to be deported to a detention camp on the island. The plaintiff in the case, a Bangladeshi woman identified only as M68, entered Australia seeking asylum and was classified as an unauthorized maritime arrival before being sent to Nauru. She was returned to Australia due to medical problems, where she gave birth to a child and filed the case to avoid being taken back to Nauru. But Australia’s High Court ruled that the woman’s detention on Nauru was not unlawful as it had been authorized under Australian migration laws, and that the offshore processing deal with Nauru was valid under the constitution. The Guardian reported that six out of seven judges ruled in the favor of holding the refugees in the offshore processing centers, and ruled that the Australian government detaining the woman was authorized by law. The detention center on Nauru houses about 500 people and has been widely criticized by the United Nations and human rights agencies for harsh conditions and reports of systemic child abuse. Daniel Webb, director of legal advocacy at the Human Rights Law Center, decried the judgment of the court. “It is fundamentally wrong to condemn these people to a life in limbo on a tiny island. The stroke of a pen is all that it would take our prime minister or our immigration minister to do the decent thing and let these families stay,” said Webb. Children born in Australia to non-citizens or parents without legal residency are not entitled to citizenship until after their 10th birthday, and then only if they have lived most of their lives in Australia.